Yesterday, while catching up on my e-reads in the office, I came across Kate Spade's Spring '16 lookbook and it completely brighten up my day. Deborah Lloyd, the Chief Creative Officer at Kate Spade, describes this particular catalogue as "After a harsh winter, when that first day of spring breaks, how relieved we all are to buy our first flowers at the bodega." I think she really nailed the concept and it shows throughout this collection. 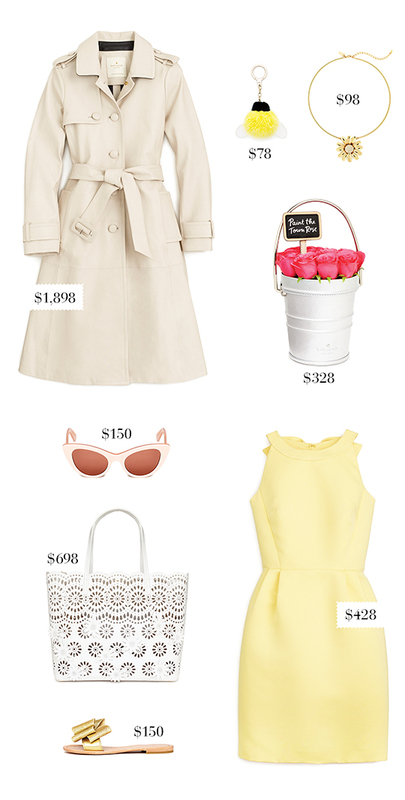 I love everything from the Madison Ave Lisbeth trench coat to the rose pail bag and lemon yellow bow-back dress. Click past the break to see more fabulous pieces from the brand's new spring arrivals. $1800 trench? Who do they think they are, Burberry? I'm actually curious as to why they're charging so much for that particular trench. They have another trench for under 500 on their website. Regardless, everything is really adorable, especially that white top handle bag! The $1,898 trench coat is actually from Kate Spade's Madison Avenue collection (the brand's higher-priced line), but I do agree it feels a bit too steep for Kate Spade.